Fuerteventura (Fuerte – strong: Ventura – happiness) has been described as “the land that time forgot”. It is the second largest of the Canary Islands and coming here really is like stepping back in time! Many people mistakenly believe the name of the island stands for “Strong Wind” and, although there is often a steady, pleasing breeze, this is usually a welcome relief that makes the hot temperatures a pleasure. It also makes Fuerteventura a water sport paradise – windsurfing, surfing and kite surfing take place all over the island. The first thing you are struck by when landing at the airport is the stark, lunar landscape. But explore beyond that and you find vast sweeping sand dunes, lagoons, little fishing villages and isolated sandy coves. 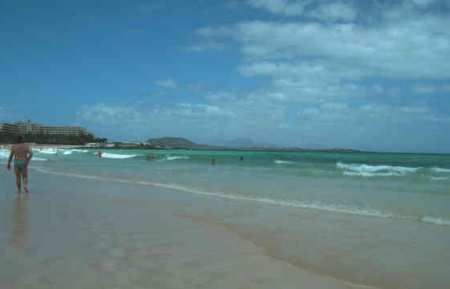 Fuerteventura is one of the least spoiled and least discovered of the Canary Islands. With a dramatic volcanic landscape, little rainfall, and all-year-round warmth, the desert landscape is unique. Large areas of the island are protected parks. The island, the closest of the Canaries to Africa, has an embarrassment of beaches - over 150. Some are in deserted coves and little fishing villages, others down little dirt tracks. But the most popular ones can be easily reached from the main roads. Not that main roads resemble those found in mainland Spain. Yes, they are well maintained and mostly straight, but the lack of traffic is the first thing you notice... and the lack of traffic lights. So far I’ve only discovered one on the island - and that has never worked! 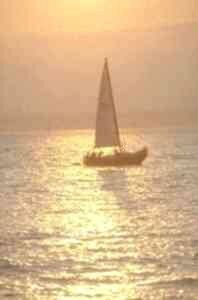 Travelling is easy, buses and ferries are cheap and, what is more, they run to time and integrate with each other. So you can get from, say, Caleta de Fuste to Corralejo with ease. Caleta de Fuste is very much an up-and-coming resort geared to families. You can find restaurants of all nationalities to suit all tastes and all pockets. There are shops and bars where you can choose to have a quiet drink and watch the world go by. Entertainment can be found – everything from live groups and cabarets to karaoke, quizzes and bingo – but it is not as ‘in your face’ as Benindorm or the Costa del Sol. There are even places open to the early hours – but you won’t be disturbed if you want a quiet night. Even the airport here turns off the runway lights and locks up at night time! 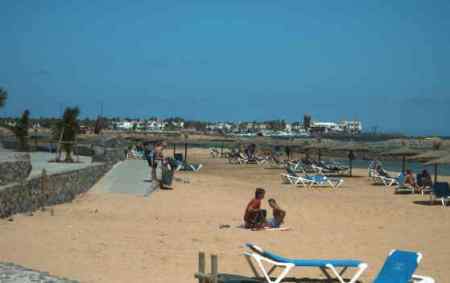 Caleta has a golden sandy beach set in a bay shaped like a horse-shoe. The gently sloping shore makes for very safe bathing and this beach is the one most holidaymakers head for. But there is a south beach – reclaimed from the sea and landscaped into small bays which are dotted with small circular brick structures to provide some privacy. Caleta de Fuste is an ideal base for exploring this island, being midway between north and south. Head north to Corralejo where the first few self-catering apartments appeared all those years ago. Now it is a bustling resort and the holiday industry has taken off in a big way. Approaching Corralejo the landscape gives way to miles of immense, shimmering sand dunes, reminiscent of Saharan Morocco, just 60 miles to the east. The famous dunes are now a protected national park. Corralejo town itself still retains some of the charm of its early days, especially around the old harbour area. From here you can see spectacular views of Lanzarote and the Isle of Lobos – well worth a visit if you find even the pace of life on Fuerteventura a little too much! Also in the north of the island is El Cotillo, a paradise for surfers. This lovely relaxed village has some great beaches, interesting lagoons and some good restaurants and bars. As you head into the village you will come across the new harbour. To the left are vast golden beaches and to the right are lagoons. On the left of the village is the Forteleza del Toston, a round stone fort built in 1790 to defend against pirates. The beaches are made for water sports lovers and many experienced surfers head to the stretches of sand between El Cotillo and Corralejo. The lagoon area is much calmer and peaceful – white beaches with crystal clear waters. This fishing village is a shrine to the Virgin de Buen Viaje (good travel) and these words can be seen painted on the cliffs overlooking the old harbour. Heading from Caleta de Fuste to the south of the island you'll find the beaches of the Jandia Peninsula, almost 20km of vast white beaches, some over 1km wide. 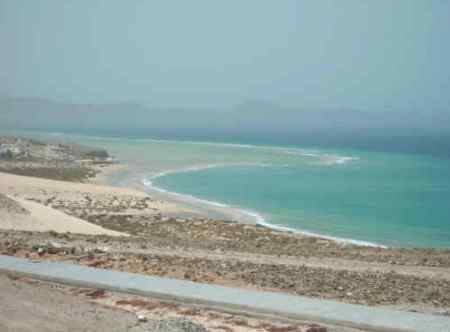 This huge area includes golden white shores which vary from pretty coves backed by low cliffs at the Costa Calma end to huge dunes, vast desert-like areas and lagoons. It also includes the beach immortalised on thousands of postcards: the Playa de Sotavento is probably one of the most photographed beaches in Europe. It is also the spot to which the surfers flock. The PWA world windsurfing speed and slalom event draws the best windsurfers every year and the world kite surfing championship was held in 2005. At the southern end of the Jandia Peninsula is Morro Jable, another well developed resort with golden beaches and one which is well loved by German package tour operators. So loved, in fact, that even many road signs here are in Spanish and German. With so many beaches, not surprising naturists also love the island. It would be impossible here to list them all but there is a very good guide to the best beaches – and to the best naturist beaches – at the Holiday Fuerteventura island guide website (see below). But Fuerteventura is not just about beaches. It is also about sightseeing. One of the most awesome sights on the island is the shipwreck of the American Star – a huge ocean-going liner which ran aground in a deserted cove several years ago under mysterious circumstances. How this ship – once the biggest of its class in the world – came to rest there is another story -and a controversial one at that - but the sight of this towering wreck lying just yards off shore in a deserted cove just outside Ajuy is a very eerie and haunting sight. 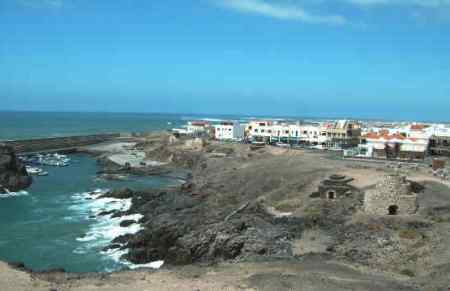 It is not easy to find but the Holiday Fuerteventura website includes instructions. From here, take the mountain road to Betancuria, former capital of the island, and you will be rewarded with some truly spectacular views - and the town itself is well worth spending a couple of hours in. Or try visiting Cofete - hard to reach, but the beach runs for about 5km, is white and sandy, and has plenty of room; at its southern tip lies Cofete village – isolated and used mostly as a weekend retreat. Giniginamar is ideal if you are seeking peace and quiet. The beach, bordered by palm trees, is of black volcanic sand and in the village itself you can find local tapas and, on the outskirts, some rather exclusive properties. Arts and crafts are well catered for – Fuerteventura is not known as the ‘island of sculptures’ for nothing! On almost every roundabout throughout the island you will find a sculpture of some form! There are a number of museums, a craft centre at Antigua which is based around a converted windmill, and the arts centre at La Olivia which has beautifully landscaped gardens and which features many works by the Canarian artist Alberto Manrique. Or La Alcogida, a living museum based around a village which shows you the way Canarians lived years ago. There are many other parts of Fuerteventura that lie hidden from the mass tourism market - but long may it remain that way! A useful and practical general guide to the island. Lots of information about the island. We found it best in Netscape/Mozilla browsers. If you enjoyed reading the above article then you will probably also enjoy Krak�w in Poland, also in Europe, and our latest articles covering the Orinoco Delta, La Mata, Marbella and Beijing.